Let's see. Hmmm...let's see. Oh yea. My Pillsbury recipe isn't working out so hot. My knees and hip joints are getting really annoyed from the excess gluten/sugar consumption from the previous recipe attempts so I decide to wait a few days before I try my recipe again. I mean, it makes total sense right? A woman with gluten/sugar sensitivities attempting to win the Pillsbury bake-off. No irony there at all. Whatsoever. 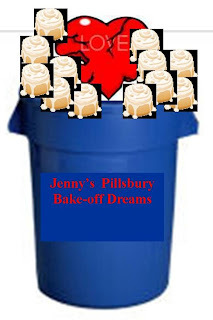 So a few days go by and I can hear the remaining piecrust and can of crescent roll dough beckoning me....Jennyyyyyyyy....we want transformed...Jennnnnnnyyyyy...we are waaaaaiiittting for you. It kind of freaked me out really because they were mighty persistent but, hey, I was busy and I kind of felt like walking without screaming in pain was the momentary priority. But from my dream I now realize what is wrong with my first attempt at the recipe. So, I do. I dock the piecrust (cool way of saying poking holes with a fork - it's a term that all of the million-dollar Pillsbury bake-off winners use) and bake it and cool it. Then I spread out the crescent rolls, lay the piecrust on top and try rolling it up. OK, that didn't work. At all. Not even a little bit. So I take a measuring cup and kind of whack the surface of the crispy piecrust and that looks like it will work better. Now I have some gushy crescent roll dough, some very crispy piecrust crumbled up and I have absolutely no idea what else it could possibly need. I decide it needs nothing. So I roll it up, slice it and bake it. In my sweetest tone I call my husband out from his home office! "Oh baby face," I say, "I have a surprise for you." And like the trusting fellow he is he comes out to the kitchen. He does not look pleased to see the fourth incarnation of the recipe. "I thought you forgot all about that," he says, kind of crankily. "No way! Remember it's a million bucks! Give them a try, I think they're perfect now!" I am trying to avoid sampling because my knee joints feel almost normal again. I watch his face carefully. "OK, this is better then last time," he says, "but what is the point of it? It just tastes like a bunch of dough." It does taste like a bunch of dough. But it doesn't make you want to throw up which is a big improvement. And is tasting like dough a bad thing? I kind of feel like Pillsbury might want a recipe that taste like more then flaky dough. After he returns to his office refusing my very sweet offer to make him a plate of my tasty little rolls to go with his coffee I have a brain-storm. Eureka! I realize I need flavors in there. I leave the yummy little dough-like things on the counter and dash out to the store. When I return all the bake-off rolls are gone from the cookie sheet. Awwww....he did like them after all. I thought if I left them there he would try them again and realize that they really were scrumptious and that there was a point to them after all. I love him. He is the best husband. I want to be married to him until my last breath. A bit later I go to throw something in the trash and there are my rolls! WHAT????? I look carefully and realize that there are 11 1/2 rolls in the trash. I feel rejected. I feel hurt. I realize I have never really been fond of him and that our marriage could possibly be on the rocks. I never saw this clearly until the vision of my broken heart mingled so clearly with the smashed up bake-off rolls. I'm going to make this recipe totally irrestible! and when it is I will not even give him a teeny, weeny taste. And when I am standing on the Bake-Off stage accepting my million dollar check I will not even look at him to punish him for not eating these flavor-less rolls in support. Yes, that's it. I'll teach him. Holy moly. Now I realize there must actually be a "and more" website for every single product in the world. You are one determined woman! What about cream cheese with something? Or cinnamon? Jenny, too funny of a story! Oh my lands... you crack up!!! I can't believe they went in the trash. The nerve. Ok I came over the try your comments. I just tried mine and I think it is fixed now. Mine shows me one easy step so maybe it is back to normal since the other issues seem fixed now-FINGERS CROSSED. GETTING READY to do my post and you gals will be excited. Ok I have a few that do this and I don't know how they have it set up --your post is 2 tries before it goes through. The first time I hit enter it says Request couldn't be processed please try again and the second time it goes through. I have some that take 4 tries. Try mine again and see if it is back to normal now that it seems fixed and tell me how it is.